Once I started reading The Noticer, I didn't want to put it down. It's about a mysterious old man named Jones. He meets different people who are going through some kind of crisis in their life. The people he meets are kind of leery of him at first because he always seems to know who they are and what problems they are facing. Another strange thing about the old man, is that everyone seems to know him or someone he knows. He's just always around and always helping others. Jones notices things about people and likes to offer what he calls perspective or a broader view. This encourages people to look at themselves, make changes, and begin their lives anew. It's all in how you look at your situation. It's making lemons out of lemonade. He teaches people to make small changes that will lead to big results in their lives. It's a very heart-warming read. I liked getting to know the characters and seeing how Jones would help each one. The book has a lot of useful information in it to help us become not just better noticers, but better people. 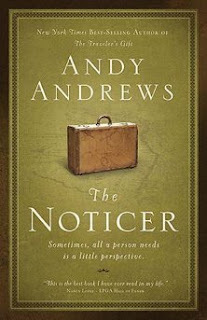 I really enjoyed The Noticer and recommend reading it. It may inspire you like it did me! Hi Nancy, This sounds like a great book. I don't know how you have time to read with all your responsibilities but I am glad that you do and can pass along the good ones to us. How's the garden coming along? Have you had real hot temps yet? We were near 90 for about 3 days. ugh! Harriet and I thank you for your sweet comments. She was mama's dog and I guess we spoil her to make up for the loss. She's a lot of company to us. Have a great day Nancy. I woke up this morning thinking that I was due to buy some books, so this one will definitely go on the list! It sounds so good! I would rather read than do just about anything else, and with winter setting in here, it's always good to curl up in the evenings with a good book! Thanks for the recommendation! Sounds great, but I haven't had time to read a book in years, lol. Five to be exact.